Glangoyne Teapot Dram is a whisky that is only available for purchase at the Glengoyne distillery in Scotland. It is matured in ex-sherry casks and bottled at cask strength, ready to quench the thirst of some of the whisky faithful who embark on a pilgrimage to the land of Scotch. The Teapot Dram commemorates a 150 year old tradition at Glengoyne which resulted in leftovers from the daily staff ration of three large drams being stored for (quite understandable!) safe keeping in a copper teapot. Fun times. Malt Mileage has been very lucky to secure samples of Glengoyne Teapot Dram batch #1 and batch #3, so without further ado let me introduce you to these two fine drams. On the nose batch #1 glistens with poise, elegant yet bursting with the aroma of cherries, cocoa, dry Oloroso, crushed whole walnuts, vanished wood, fresh herbs, mint, anise seed, fruit cake with glazed cherries and undertones of toasted and fleshy coconut with banana and a nutty Moroccan baklawa shining through it all. On the palate batch #1 is smooth, balanced and yet manages to electrify the taste buds to life with a sudden surge of dry woody Oloroso, nuts and the most delightful crumbly cocoa rich cherry pie infused with cinnamon, natural mint, herbs and tea. The finish is long, and the palate gently dries as the flavour of Oloroso, cinnamon and dark honey lingers. Overall Glengoyne Teapot Dram Batch #1 is the kind of dram that makes most other whiskies seem clumsy, unbalanced and pretty darn average as it ignites the palate with what I can only describe as a dramgasm of heavy Oloroso goodness. For an added bit of guilty pleasure try matching it with some creamy bocconcini, pecorino or a tea/botanical infused cigar. On the nose batch #3 is sweeter and softer than batch #1, being less dry and projecting less woody Oloroso and varnish notes. Batch #3 offers more sweet vanillas and subtle undertones of sherry, with a herbal cough drop glow that melds with green jelly beans, mixed fruit cake and rummy notes very similar to spiced English style rum, and, an earthy coffee heavily spiked with anise seed liqueur and cinnamon mixed with brown sugar. As the whisky rests notes of toffee develop with banana and coconut. On the palate batch #3 offers more pronounced wood notes and Oloroso than the nose suggests, weaved together with chocolate and a vegetal burn that is accompanied by the taste of vanished wood. The finish is drying and woody with intensifying notes of Oloroso, wood varnish and tannins. Overall, Glengoyne Teapot Dram batch #3 is a complex and interesting dram that offers a descent hit of Oloroso on the palate but for me it tasted over-oaked with varnish and excessive tannins, falling short of the delectable Glengoyne Teapot Dram batch #1. 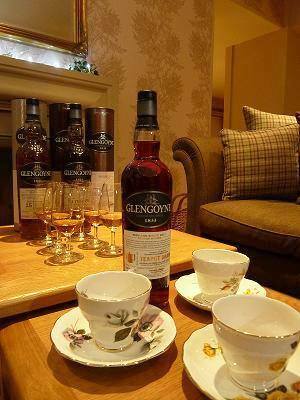 This entry was posted in Highlands and tagged cheese, dram, glengoyne, Scotch, scotland, sherry, tea, teapot, whisky. Bookmark the permalink.